Ever since Balboa first gazed upon the Pacific Ocean in 1513, Europeans had dreamed and schemed of ways to connect the Gulf of Mexico with the large ocean to the west. Four hundred years later that dream was realized with the opening of the Panama Canal. It took ten years and many millions of dollars to construct the giant locks through Panama's deadly jungles, but completion of the monumental project assured America's stature as a world power. It had been apparent since the Spanish-American War that floating a two-ocean navy was logistically overwhelming, and shortly after the conclusion of hostilities, plans began in earnest to connect the two oceans. Congress felt the canal was of such importance that in 1915 it appropriated 50 million dollars for an exposition celebrating its completion. San Francisco was selected as the site of the festivities, giving that city an opportunity to showcase the rebuilding undertaken since the devastating earthquake of 1906. Congress also authorized a series of commemorative coins to mark the occasion: a silver half dollar, a gold dollar and quarter eagle, and an extraordinarily impressive pair of $50 gold pieces. 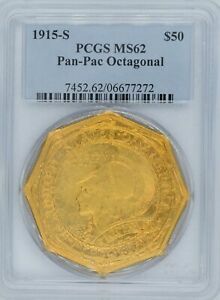 One unusual aspect of the legislation provided that of the 3,000 fifty-dollar coins authorized, half were to be round and the other half octagonal in shape. These massive gold coins were modeled after the fifty-dollar gold octagonal "slugs" struck in Gold Rush California by Augustus Humbert and their round counterparts struck by the Wass-Molitor firm in 1855. 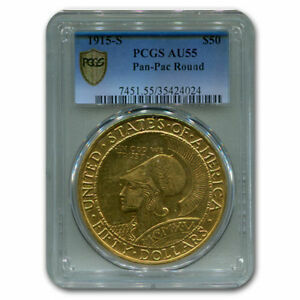 Although the coins produced by Humbert at the U.S. Assay office at San Francisco were officially authorized issues, the Pan-Pac fifties would be the first coins of that denomination issued by a U.S. Mint. New York artist Robert Aitken was selected to design both the round and octagonal fifty-dollar coins. 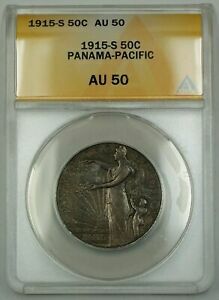 Aitken was an accomplished sculptor, but the Panama-Pacific commemoratives were his first attempt at coin designs. Critics had a field day with his creation, ignoring the aesthetic merits of the design and complaining that "there is nothing American about the coin except the inscription." On an artistic level, however, Aitken's work is a rather successful attempt to blend classical Greek motifs with modern coinage. He used the same design for both coins, but slightly reduced the design elements on the octagonal pieces to fit within the border. His subjects were the Roman goddess Minerva (after the Greek goddess Athena) and an owl, symbols, as he put it, "full of beauty in themselves," that would also express "the larger meaning of the Exposition, its appeal to the intellect." Aitken's appeal to the intellect, however, required some interpretation, which fortunately was included on the packaging accompanying the five-piece sets consisting of the two fifties, a quarter eagle, gold dollar, and silver half dollar. To the Romans, Minerva was the goddess of wisdom, skill, contemplation, spinning, weaving, agriculture and horticulture, all undoubtedly admirable qualities. Ironically, she was also the goddess of war, albeit representing the more reflective and civilized side of conflict. As the central design of the Panama-Pacific $50 pieces, she wears a crested helmet, pushed back to signify peaceful intentions - a symbol of American sentiment towards a Europe deeply embroiled in the carnage of World War I. The date appears in Roman numerals - MCMXV - at the top of Minerva's shield. The entire central design is surrounded by a "Morse code" circular border, actually a long and short-beaded motif, also adapted from Classical Greek design. Although some critics of the day remarked about the dolphins encircling the border of the octagonal pieces, sarcastically commenting that it seemed as if the canal was built for their benefit, the dolphins quite suitably symbolize the uninterrupted waterway created by the canal. The coins' reverse depicts an owl perched on a Ponderosa Pine, surrounded by cones. Owls were sacred to Minerva, and the bird is commonly recognized as a symbol for wisdom as well as for watchfulness, alluding to America's need for vigilance on the eve of its entrance into the European war. The beaded border is repeated again on the reverse, separating the central design from the statutory legends that surround the perimeter of each side: UNITED STATES OF AMERICA and FIFTY DOLLARS on the obverse, PANAMA-PACIFIC EXPOSITION and SAN FRANCISCO on the reverse. The motto IN GOD WE TRUST appears above Minerva's head, while E PLURIBUS UNUM is to the right of the owl. Aitken's initials are tucked away on the reverse in the field above the R in FRANCISCO, while the S mintmark is located between the lowest right pinecone and the beaded inner border. Because of the coins' large size, a special 14-ton hydraulic press used for striking medals was sent from Philadelphia. Although officials considered striking the coins on the fairgrounds, the final decision kept production in the San Francisco Mint. The first coins were struck on June 15, 1915, and a total of 1,509 octagonal and 1,510 round fifties were produced by the end of the summer. The odd 19 pieces that exceeded the authorized mintage were reserved for assay. The first 100 coins struck were distributed to various dignitaries and Mint employees. 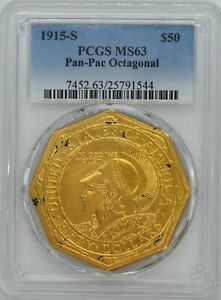 Despite the popularity of the coins' large size and appealing design, only 645 of the octagonals and 483 of the rounds were sold. The remaining pieces were melted in November, 1916. Intimately associated with the promotion and distribution of the Pan-Pac fifties, as well as several other commemorative issues from the early 20th century, was Farran Zerbe. Zerbe's numismatic reputation and political clout was such that he was placed in charge of the Exposition's Coin and Medal Department, which he incorporated into his own traveling exhibit called "Money of the World." As an energetic promoter of numismatics for several decades, Zerbe did more to popularize coin collecting in this country than any other individual, with the possible exception of B. Max Mehl. Zerbe marketed the five Pan-Pac commemorative issues in various combinations: single coins, short sets of three, full sets of five and double sets of ten coins that showed both sides of each coin. He offered the coins to collectors through the mail, to the general public at the fair and in special mailings to bankers. 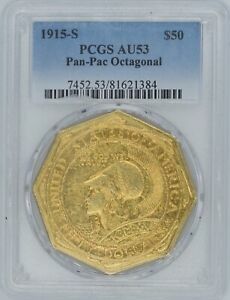 Although his marketing methods were laudable, finding buyers at $100 for a $50 gold coin when wages were low, interest in numismatics was insignificant, and political and economic uncertainty high, was a difficult task at best. The artistic beauty, size, and rarity of the Pan-Pac fifties place them among the few commemorative issues that are widely recognized and sought by non-specialists. The net mintage figures reflect both their absolute and relative rarity: the lower-mintage round variety is the scarcer of the two. Many surviving Pan-Pac fifties suffer from slight handling friction on the cheek and helmet of Minerva and on the upper portion of the owl's breast. Often the corners of the octagonal pieces will show rim bumps and nicks. Most examples will range from AU-55 to MS-63: gem examples are quite rare and seldom offered for sale. 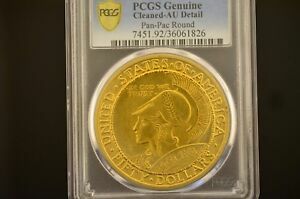 Almost as coveted as the coins themselves are the original-issue holders: The cases made for single $50 pieces have sold in the $400-$800 range, while the hammered frames for five-piece sets bring several thousand dollars each. The extremely rare double-set, framed holder is even dearer: one example sold several years ago at auction brought an astounding $18,000!